The new hull brush makes 3D sculpting a breeze. Google's Tilt Brush is one of the best VR painting apps for the Oculus Rift and HTC Vive. Since its release in 2016, artists have drawn magnificent ships, jaw-dropping mountain ranges and imaginative fight scenes in immersive 3D. Most of the app's brushes, however, mimic the real world with flat, ribbon-like strokes. For years, you've had to move around and paint, or 'color in' every surface of a 3D object like a cube or cone. It was pretty time consuming. Thankfully, the team behind Tilt Brush noticed and introduced a solution, called the hull brush, toward the end of June. The new tool allows you to paint volumetrically. Normally, the app follows your movements in mid-air and creates a series of control points. These are supplemented with secondary points and then converted into colorful brush strokes. The hull brush, however, uses the control points to create a 3D mesh. The outermost points dictate the final size and shape, which for now has to be convex (curving outward, rather than inward). "The simplest way to think of a convex hull is as if you were 'gift wrapping' the points with geometry," Jeremy Cowles, the technology lead for Tilt Brush explained. In practice, you simply move the Rift or Vive controller through 3D space and watch as an abstract object is 'filled in.' With a single gesture, you can create a slab-like blob that is clearly visible from every angle. Now, people are embracing the hull brush as a way to quickly build characters and scenes. Steve Teeple, a concept artist who has worked with Marvel, Google and The Weeknd, among others, used the tool to create a dark and mysterious astronaut on June 29th. It's a wonderful creation that could easily pass for some new Mass Effect or Destiny artwork. "It's a bit of a game changer in the Tilt Brush world," he explained, "because while technically all the brushes create geometry of some kind when exported, usually a flat plane, it's the first real 3D like brush we've seen added to the app." The hull brush was made in response to user feedback (including a Pixar employee) who wanted a simpler way to create 3D objects. "If you've ever tried to create a solid sphere Tilt Brush without using any guides, the need is painfully obvious," Cowles said. At first, the developer experimented with concave (inward facing curves) hulls because they were easier to implement "and mathematically well defined." The user experience was unnatural, and for a while, Cowles considered abandoning the idea. He showed the team a couple of prototypes, though, which led to the convex-based tool available today. "It quickly became clear that it was worth keeping," he said. Artists are profiting from that decision. Cesar '3Dominus' Ortega, for instance, used the brush to make a human anatomical figure grasping a sphere of light. The final version, titled 'Solve Et Coagula', presents him as a god-like figure at the center of the universe. It was named after a motto in alchemy (it loosely means 'dissolve and coagulate') and is captioned on Google's Poly site with a quote by the French surgeon and biologist Alexis Carrel: "Man cannot remake himself without suffering, for he is both the marble and the sculptor." "It has expanded what's possible," Ortega said. 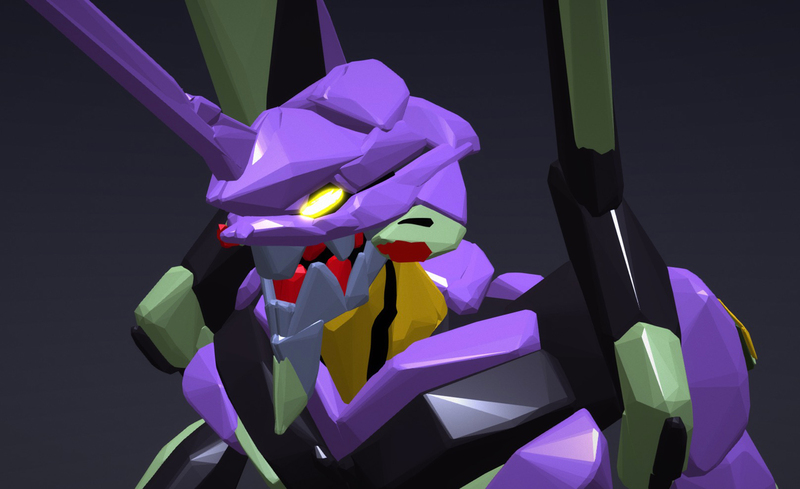 Tipatat Chennavasin, co-founder and general partner of the Venture Reality Fund, drew the iconic Unit-01 from the 90s mecha anime Neon Genesis Evangelion. Others have used it to paint tranquil beaches and motorcycle-riding robots. The brush can be unpredictable, though, according to Lee Petty, an artist and game developer at Broken Age studio Double Fine. "[There are] lots of happy accidents, which I find important for conceptual design," he said. It's also impossible, at least for now, to create concave shapes with a single stroke. To make a character like Pac-Man, for example, you have draw and place two objects on top of one another. "It has a unique look," Bastiaan 'Naam' Hooimeijer, co-founder of 3D animation studio Happy Ship added. "The results feel like Play-Doh to me." Tilt Brush isn't the only app to offer volumetric painting. Google offers precise polygon modeling, for instance, in its VR-friendly Blocks application. Oculus Medium and ZBrush, meanwhile, offer sophisticated sculpting tools. Every app has a slightly different implementation and look that benefits particular projects. "It's a super-simple idea and surprisingly novel," Cowles said. "I've personally not seen convex hulls used like this in a creative tool." Most artists are still using Tilt Brush for fun or as a way to quickly prototype ideas. Vishnu Ganti, an interaction designer in San Francisco, used the hull brush to mock up an inventory system for a new VR video game, for example. "As someone who loves precision, I wouldn't mind having more grids and guides available in the toolset," she said. "But for now I will be using Tilt Brush more to quickly test out ideas for spatial design." The latest update, though, has positioned the app as more of a professional tool. One that could be used in conjunction or as a replacement for traditional 3D modeling software some day. "Most of the time I show Tilt Brush as a first-time VR demo," Teeple said. "It really allows for anyone to pick it up and make something. But with these new additions and the experiments I am already seeing, [the app] will only encourage and bring in more pros who can see how it might creep into their workflow. To me, all these VR creative apps are tools in a pipeline that I can mix and match to suit my needs as a 3D artist. Tilt Brush continues to secure itself a space in that toolkit for the foreseeable future."